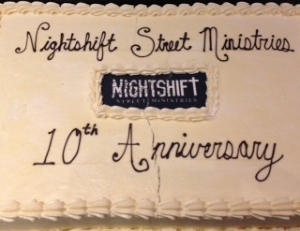 On Saturday evening (November 23), NightShift Street Ministries marked 10 years of working with homeless, hungry and broken people, with an ‘UnGala’ that raised over $20,000. That is not the whole story. Four major Surrey business leaders have put up a $100,000 challenge, with an end-of-year deadline. CityWatch readers are encouraged to go to NightShift’s website to learn how they can help meet the challenge. The funds raised are only a portion of what NightShift needs, but they come in at a time of both celebration and relief. 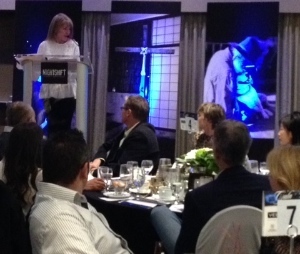 NightShift continues to gain strength, tut founder/president, MaryAnne Connor (fondly known by most as Mac), told the crowd that the past year has been one of the most difficult, as support funds shrunk considerably – a situation facing many non-profits and charities. The UnGala took place at the Shearaton-Guildford Hotel, a five-minute B-line bus ride from the centre of Mac’s universe for the past 10 years. Between Central City and Gateway, the northern portal to the emerging urban centre, is the area still known to locals as Whalley. There NightShift, with the assistance of a few dozen churches and their volunteers, and the financial assistance of, among others, Central City’s homebuilders, provides a meeting/meal/counselling/prayer place for many of the people who society has almost forgotten. 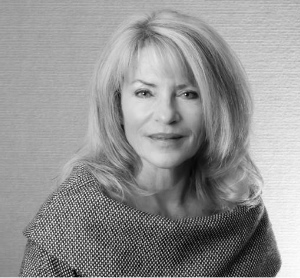 Ten years ago, Mac was a successful real estate consultant whose own personal pains opened her to a unique understanding of people with broken relationships and addictions. Diminutive, sharp, persistent, disarming, biblically-rooted and opening easily to people wherever they might be in life, Mac started NightShift by organizing overnight accommodation for homeless people in Gentle Shepherd Church, near Gateway. City officials were not too sympathetic, so she and her growing team of staff and volunteers offered nightly hot meals under a tent at the side of a Whalley park. In due course, the first of a series of ‘permanent’ accommodations became home to NightShift. Today, several thousand square feet serve the purpose, next door to Sisters, a popular used clothing boutique run by NightShift. Across the parking lot are their faith-based cousins at the Mennonite Central Committee Thrift Store. The cluster is located on the west side of King George Boulevard (formerly Highway) a short distance south of Gateway. Mac recently wrote ‘The Shift,’ about NightShift’s first decade. The Care Cottage dreams had to be put on hold earlier this year, after the financial crunch hit. But Mac and her colleagues are looking for the first opportunity to implement the plan, outlined in The Shift: The Power of Belief, which Mac wrote to tell the story of NightShift’s first decade. In The Shift, Mac describes NightShift’s oft-rocky relationship with the city bureaucracy and Whalley business community, a relationship which, she says, started to improve when Dianne Watts became Surrey mayor. To understand that particular ‘shift,’ the reader needs to check out Watts’ introduction before reading the rest of the book. As to the UnGala itself, it was a colourful evening, visually, audibly and economically. 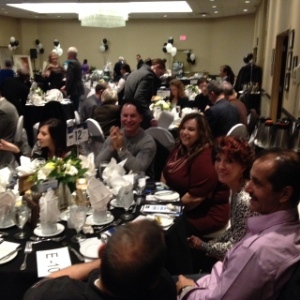 Besides the usual fund-raiser fare of roast beef, there were ample portions of black bean chili and gourmet mac and cheese – the kind of meals NightShift’s clients might expect of a winter evening. Silent and live auctions filled out the evening, with auctioneer and MC Mike Betcher successfully cajoling supporters to spring just a little more from their pockets than they might have originally planned. Kelita, the Christian singer who recently moved with her husband, Gordon, from Toronto to Surrey, put her own abused past, as a child and an adult, into both song and spoken word. She moved Mac to tears – not a totally impossible project – when she worked the words of the popular worship song into her script. The reason for the tears: that song was central to Mac’s epiphany when her faith shifted to a love for Whalley people in those beginning days for NightShift. With Lloyd Mackey’s return to Surrey – into the Central City urban centre, to be specific – his OttawaWatch column is now called CityWatch. Lloyd is continuing his Doctor of Ministry studies through Tyndale Seminary in Toronto. For feedback, he can be contacted at lloydmackey@shaw.ca.